New Zealand’s Football Ferns will meet Solomon Islands in the first semi-final on Wednesday at 1pm while Papua New Guinea will take on Cook Islands shortly afterwards at 3.30pm. The Kiwis and Cook Islanders confirmed their Group A placings of first and second yesterday but Papua New Guinea and Solomon Islands had to wait until their Group B matches today to find out where they would end up. Coach Francis Moyap and his Papua New Guinea team made sure they would finish top with their third win on the trot, a fairly straight-forward 3-0 dismissal of Tonga. Zeen Limbai struck in the 28th minute to get the ball rolling and added another on the hour mark before an own goal in the 74th minute rounded off the scoring. Tonga put in plenty of effort in their bid to keep their campaign alive but struggled to threaten Linda Bunaga in the Papua New Guinea goal. They can leave Auckland with their heads held high though after earlier posting a 2-1 win over Fiji. Two-goal hero Limbai now has four strikes to her name and has been one of Papua New Guinea’s most eye-catching performers. She is pleased with how the tournament has gone for her and is bullish about her side’s title prospects. Today’s other match was an even encounter as Fiji’s strength was countered by the speed of the Solomon Islanders. Few chances fell to either side with Solomons striker Ileem Pegi going closest in the dying stages of the first half as her shot was well blocked by goalkeeper Lice Waqailiti. The second spell was a more exciting spectacle as both teams pushed for a winner. Solomons goalkeeper Betty Sade made a fingertip save in the 77th minute to deny Kurukaba Ligavola while Fiji defender Lajipa Rasaku almost scored an own goal moments later as she chased down the ever-dangerous Pegi. With plenty of pride to play for, Fiji almost had the winner in the 83rd minute as Ligavola broke through on goal only to strike her shot against the left-hand upright. Fiji coach Ramesh Sharma was philosophical about his side’s performances during the week. 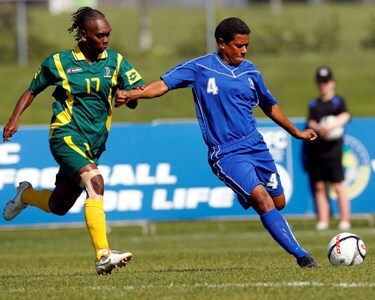 Solomon Islands meanwhile have shown how far they’ve come since the last edition of the competition in 2007 when they managed just one goal and conceded 14 to pick up the wooden spoon. Assistant coach Diane Justus, who was part of that squad three years ago, says her team has high aspirations this time around. “We didn’t play that well today but we’re happy because we’re through to the next stage,” she says. Both of Wednesday’s semi-finals will take place on the oval ground at North Harbour Stadium.